The Los Angeles Press Club announced about half of the finalists for awards at its annual banquet. 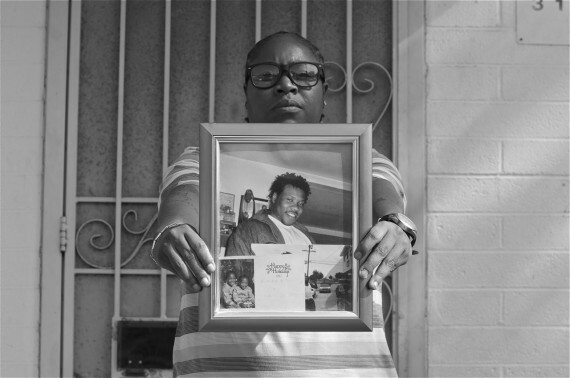 Thus far, Streetsblog Los Angeles’ staff is nominated for three awards. We are still awaiting word on five other nominations (two more for Sahra Sulaiman, one for me, one for Brian Addison and Streetsblog Los Angeles itself as “best blog). Award-winning journalism isn’t free, and during Streetsblog’s pledge drive month; its doubly important that if you haven’t given to Streetsblog before, or haven’t done so in awhile, you consider doing so today. What’s striking about our three nominations thus far is how they demonstrate the growth Streetsblog experienced in past years into a multi-platform news organization. The Press Club highlights the beginning of Sahra’s series on community violence and how it impacts Livable Streets. As we saw with Fidel last year, the nomination and story itself mean more to those portrayed than they do the author. This is one of many signs of how unique and important Sahra’s work is. If you haven’t read, “Death and All His Friends Cast Long Shadows When They Appear in the Public Space,” set aside some time over the next week to do so. 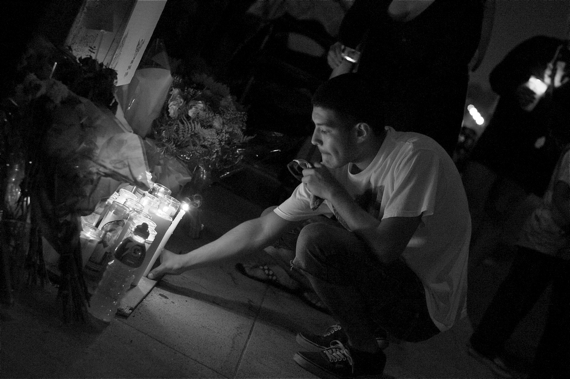 While Sahra’s coverage of the tragic hit and run crash that killed Andy Garcia was one of our most-read stories of 2013-2014; for many people it’s this picture of Jose Vazquez lighting a candle at Garcia’s memorial that many will remember. Beautiful, sad and haunting it has long been one of my favorite pieces of Sahra’s many photographic contributions despite the sad moment it captures. When I first approached Kris and Shireen about this project, I was proposing “something like a Streetfilm” for each of the candidates. But the two film-makers who took the lead on this project had a more documentary-film style which served the series well…and they still managed to add some humor and light moments from our interviews into the final project. After we released the edited videos, we also released the full (nearly) unedited audio. Last year, we were finalists for three awards. While we hope to have even more of our work recognized, for a small outlet such as ours to be continually tapped is a testament to our team. Of course, we wouldn’t exist without your support as readers, commenters, tipsters and donors. It’s that last role I’m asking you to fill today. To help us continue to grow and produce quality independent journalism, make a donation by clicking here.